Since the Apollo program wrapped up in the early 1970s, people all around the world have dreamed of the day when we might return to the Moon, and stay there. And in recent years, however, that actual proposals for a lunar settlement have begun to take shape. As a result, a great deal of attention and research has been focused on whether or not the Moon has indigenous sources of water. Thanks to missions like Chandrayaan-1 and the Lunar Reconnaissance Orbiter (LRO), scientists know that there are vast amounts of surface ice on the Moon. However, according to a new study, researchers from Brown University have found evidence of widespread water within volcanic deposits on the lunar surface. These findings could indicate that there are also vast sources of water within the Moon’s interior. For their study – titled “Remote Detection of Widespread Indigenous Water in Lunar Pyroclastic Deposits” – Brown researchers Ralph E. Milliken and Shuai Li combined satellite data with new thermal profiles to search for signs of water away from the polar regions. In so doing, they addressed a long-standing theory about the likelihood of water in the Moon’s interior, as well as the predominant theory of how the Moon formed. Lunar Crater as imaged by NASA’s Moon Mineralogy Mapper. Credit: SRO/NASA/JPL-Caltech/USGS/Brown Univ. As noted, scientists have known for years that there are large amounts of frozen water in the Moon’s polar regions. At the same time, however, scientists have held that the Moon’s interior must have depleted of water and other volatile compounds billions of years ago. This was based on the widely-accepted hypothesis that the Moon formed after a Mars-sized object (named Theia) collided with Earth and threw up a considerable amount of debris. Essentially, scientists believed that it was unlikely that any hydrogen – necessary to form water – could have survived the heat of this impact. However, as of a decade ago, new scientific findings began to emerge that cast doubt on this. The first was a 2008 study, where a team of researches (led by Alberto Saal of Brown University) detected trace amounts of water in samples of volcanic glass that were bought back by the Apollo 15 and Apollo 17 missions. This was followed by a 2011 study (also from Brown University) that indicated how crystalline structures within those beads contained as much water as some basalt mineral deposits here on Earth. These findings were particularly significant, in that they suggested that parts of the Moon’s mantle could contain as much water as Earth’s. The question though was whether these findings represented the norm, or an anomaly. To resolve this, Milliken and Li consulted orbital data to examine lunar volcanic deposits for signs of water. Basically, orbiters use spectrometers to bounce light off the surfaces of planets and astronomical bodies to see which wavelengths of light are absorbed and which are reflected. This data is therefore able to determine what compounds and minerals are present based on the absorption lines detected. To correct for this, Milliken and Li constructed a detailed temperature profile of the areas of the Moon they were examining. They then examined surface data collected by the Moon Mineralogy Mapper, the spectrographic imager that was part of India’s Chandrayaan-1 mission. They then compared this thermally-corrected surface data to the measurements conducted on the samples returned from the Apollo missions. What they found was that areas of the Moon’s surface that had been previously mapped showed evidence of water in nearly all the large pyroclastic deposits. This included the deposits that were near the Apollo 15 and 17 landing sites where the lunar samples were obtained. From this, they determined that these samples were not anomalous in nature, and that water is distributed across the lunar surface. “The growing evidence for water inside the Moon suggest that water did somehow survive, or that it was brought in shortly after the impact by asteroids or comets before the Moon had completely solidified. The exact origin of water in the lunar interior is still a big question. Between NASA, the ESA, Roscosmos, the ISRO and the China National Space Administration (CNSA), there are no shortage of plans to explore the Moon in the future, not to mention establishing a permanent base there. Knowing there’s abundant surface water (and maybe more in the interior as well) is therefore very good news. This water could be used to create hydrazine fuel, which would significantly reduce the costs of individual missions to the Moon. It also makes the idea of a stopover base on the Moon, where ships traveling deeper into space could refuel and resupply – a move which would shave billions off of deep-space missions. An abundant source of local water could also ensure a ready supply of drinking and irrigation water for future lunar outposts. This would also reduce costs by ensuring that not all supplies would need to be shipped from Earth. On top of all that, the ability to conduct experiments into how plants grow in reduced gravity would yield valuable information that could be used for long-term missions to Mars and other Solar bodies. It could therefore be said, without a trace of exaggeration, that water on the Moon is the key to future space missions. The research was funded by the NASA Lunar Advanced Science and Exploration Research (LASER) program, which seeks to enhance lunar basic science and lunar exploration science. Rather than being dead inside, the Moon still has a warm interior that is due to the effect of the Earth’s gravity on our closest major celestial neighbor, a new study says. The results came after looking at results from the SELENE (SELenological and ENgineering Explorer) spacecraft as well as other missions exploring the Moon. “I believe that our research results have brought about new questions. For example, how can the bottom of the lunar mantle maintain its softer state for a long time? To answer this question, we would like to further investigate the internal structure and heat-generating mechanism inside the Moon in detail,” stated Yuji Harada, the principal investigator of the research team. Clues to the Moon’s interior come from examining how the Earth’s gravity deforms its inside through tidal forces. 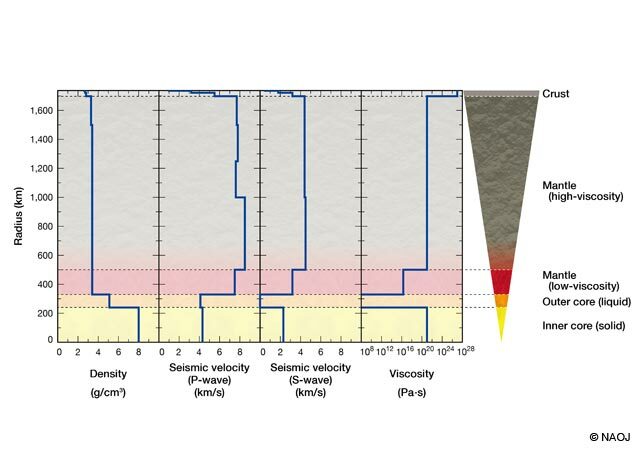 Models show that tidal changes within the moon are likely due to a “soft layer” deep within the lunar mantle. Scientists learned that the Moon has a core (inner portion, made up of metal) and a mantle (made up of rock) through the Apollo missions, which saw astronauts deploy seismic devices that revealed the interior structure. 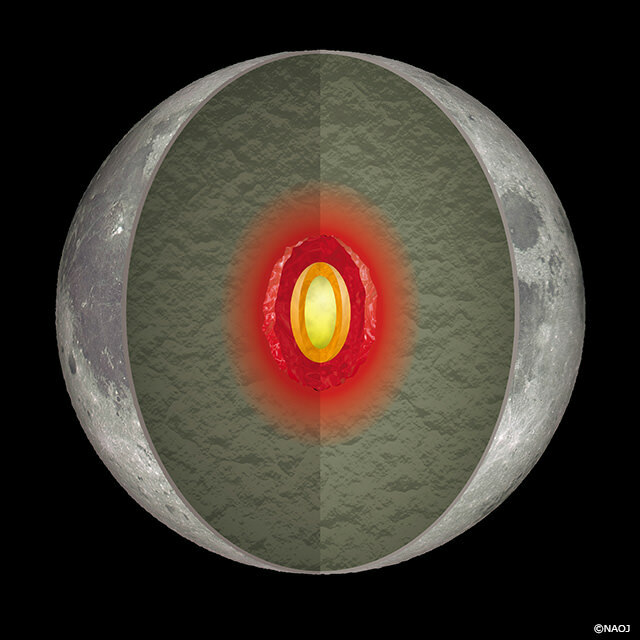 Researchers believe the heat occurs in a soft layer that is deep within the mantle, and not throughout the entire Moon. They said that possible future research directions could include why it is only this layer that remains soft, and how tidal energy changes the Moon’s cooling and its relative motion to Earth.